This one-year devotional presents the timeless, pragmatic wisdom of the book of Proverbs in 365 daily instalments. For each day there is a scripture reference and a brief reflective reading designed specifically for men. 12.7 x 17.8 x 3.2 cm. 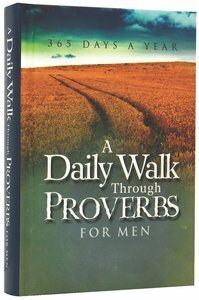 About "Daily Walk Through Proverbs For Men"
Timeless wisdom from the book of Proverbs. Each day provides opportunities to rediscover God's wisdom. This treasury of 365 Life-Altering devotions for men can help.